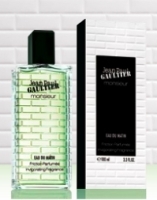 In conjunction with his new Monsieur skincare and makeup line, Jean Paul Gaultier has launched a new body spray, Monsieur Eau du Matin. The tiles on the packaging design were inspired by the Paris metro. Monsieur Eau du Matin was developed by perfumer Francis Kurkdjian, and the notes feature citrus, petitgrain, spices, cedar and guaiac wood. Menard has launched Menard For Men, a new fragrance that "exudes a sense of nobility with [a] fresh musky citrus note". The notes include bergamot, citron, woody amber and floral notes. Yet he is still the most gorgeous man I know. IIRC, JPG had a men's makeup line that didn't sell as well as they'd hoped, and this is a new incarnation. There are plenty of men using women's makeup, so you'd think they'd want their own products, maybe? Who knows. I always hate it when they just say “spices”, bot don't say which ones. Of course, some perfume makers don't give anything at all away… But the cologne sounds nice, I guess! LOL — but I'd rather see at least a partial list of spices too! Not to downplay the more obvious reasons for Gaultier's last men's makeup line not selling up to expectations, but I feel the lack of availability must have played a part. The only point of purchase I've seen Stateside is Sephora.com (but not in the brick-and-mortar stores). Here's hoping this line gets better distribution. But the Gaultier bottle reminds me a lot of Viktor and Rolf Antidote. I don't think I ever saw it at all, but then, I wasn't really looking. There are more men's skincare lines around now, maybe this one will do better. Hey, it does kind of look like V&R. I like all Gaultier's scents – I know that it is because it is a young brand, but I like it. I don't know any other brand where I can say the same. As for the make-up, if they need it…. Maybe one day they can have their own line of lipsticks and we can try them the same way we try their scents. L, I can't remember if there is a lipstick in this line, but I'm pretty sure there was one in the old JPG line for men? I'll have to check. I have to comment on that bottle! The artwork is very similar from the Jerry Springer Show logo. I think its the bricks that does it. Why can't they be more spice-cific on those notes? LOL — never seen that logo so can't comment, but that's funny! Would love to try the new Monsieur range. OMG. That's exactly it! I was wondering where I had seen this before! Too funny. I bought this fragrance 3 months ago and 1/3 of the 3.3 fl oz. bottle is already gone. I'm not sure if it goes into my books of all time favorites but I do wear it often enough…. the real sign of any good fragrance in my opinion. It really isn't strong enough to get noticed in clubs but if your goal is something for everyday wear…it should be a definite consideration. Hi Riptiki, I don't know how I missed this comment, my apologies! I still haven't tried the Eau du Matin — lots of competition this year and I can't seem to try them all. Glad you love it though!